AQUAMAN WEEK concludes here at Once Upon a Geek. To close out the week, I thought I would talk a little about the future of Aquaman. Before we get into it, you should probably know that Aquaman is currently dead. Yup, he’s sleeping with the fishes, literally and figuratively. Well… to be exact, the original Aquaman is dead; the one we all grew up with on the Super Friends. There is a new Aquaman that is alive and swimming, but he’s slightly different. Rather than the Aquaman we know (a.k.a. Orin or Arthur Curry), the new Aquaman is Orin’s adopted cousin. He’s the sword-and-sorcery Aquaman I’ve mentioned a few times this week. There is a whole bunch of confusing origin-stuff I could cover, but I’ll skip to the bottom line. The new Aquaman goes by the name Joseph and has inside him a piece of Orin’s soul. He looks somewhat like Orin and even has some memories of the original. So while he’s not the original, he makes a pretty good substitute. I’m not really going to talk about it here, but the original Aquaman does appear in the ‘DC Kids’ comic book ‘Super Friends’. In addition to the comic book, they also have some action figures. This is a line for real little kids and doesn’t have any connection with regular continuity. Geoff Johns has stated that the original Aquaman will make an appearance in the forthcoming ‘Green Lantern: Blackest Night’ storyline. We know this storyline will feature many characters returning from the dead as ‘Black Lanterns’. Now the real question is, what will happen to these characters after the storyline? Will they return to the DCU proper, or return to the grave? Based upon other conversations Johns and Sciver have had, it’s assumed by the fans that the original Aquaman will be back for good. It’s also well known that Geoff Johns and Ethan Van Sciver are interested in tackling the original Aquaman. These are the guys who did ‘Green Lantern: Rebirth’ which brought Hal Jordan back as the primary Green Lantern. Next year they will be producing ‘Flash: Rebirth’ which will return Barry Allen as the primary Flash in the DCU. So they’ve got a history of returning classic characters to greatness and pushing them forward into exciting new adventures. So it’s quite possible we’ll be reading an ‘Aquaman: Rebirth’ in the next few years. For further background on this click here. So if we get an ‘Aquaman: Rebirth’ that returns Orin to the role of Aquaman, what happens to Joseph? I for one hope they don’t get rid of him. I think there is plenty of room for multiple aquatic heroes. If Geoff Johns can write a book with numerous Green Lanterns and at least three Flashes, then why can’t we have two Aquamen? Cartoon Network has a new show called “Batman: Brave and the Bold”. 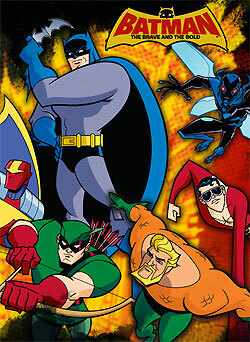 It features Batman teaming up with other heroes each week. On Friday, November 28, an episode is scheduled to air that features Batman teaming up with Aquaman. In this series Aquaman’s a bit different than he is in the comics. This Aquaman has an enormous barrel-chest and sports a close-cropped beard. Additionally, I believe he’s supposed to come off as extremely confident with the occasional corny one-liners. The target demographic is ages 6 to 15, so it might be a little kiddie for us grown geeks, but I’m willing to give it a try. Feel free to check out either the Cartoon Network web site or the DC HeroZone web site. 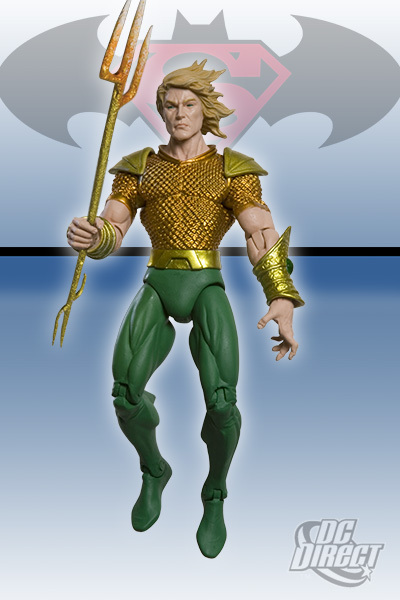 Aquaman has a handful of action figures scheduled for release in 2009. There are two particular upcoming figures that I’m pretty excited about (pictured below). Besides these two, there are also Aquaman action figures planned for the ‘Batman: Brave and the Bold’ line and for DC Direct action figures. 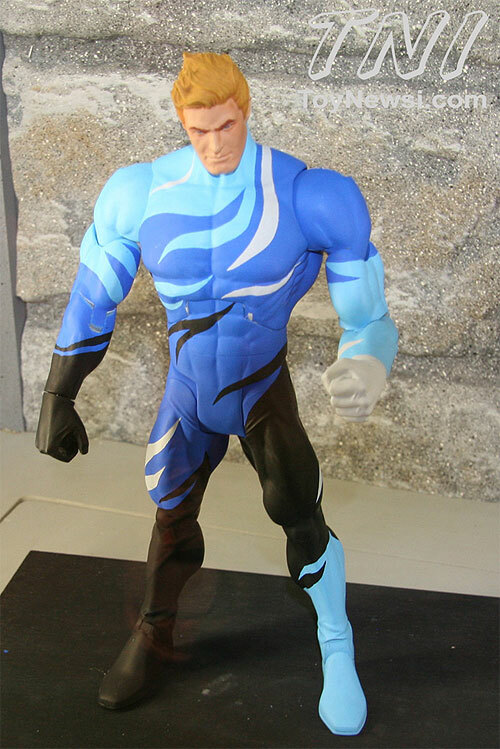 Here is Aquaman from Mattel in the blue camo suit. I can’t wait for this figure! DC Direct is putting out an Aquaman-Joseph figure in the Superman/Batman line. Looks cool! The Aquaman Shrine – The single best Aquaman source on the web. Rob does a great job sharing Aquaman-related news, displaying memorabilia, and writing about 14,000 other blogs. The Comic Treadmill – A discussion about opinions on comics, comics-related materials, movies, and games. Lots of Aquaman support here on this site. Thanks again for hanging out all week! This will do it for AQUAMAN WEEK! Well.. sort of. I’m planning an addendum sometime next week to cover my Aquaman action figures. So watch for that too! Long live the King of the sea! well, i’ll split the difference with you in regards to what to do with Arthur Joseph–i don’t want to see him killed off just to “make room” for the return of Classic Aquaman–the DCU is a BIG place! but i don’t want to see two Aquamen swimming around–i like the GL Corps idea because it was unique and it was an building block of the character from the beginning. but i really don’t want to see Classic Aquaman and Arthur Joseph around together. best to just let AJ fade into obscurity, being brought back when some story demanded it. but let’s get Classic Aquaman back in the DCU!! very fun week, thanks for all repeated shout-outs!